The 21-year-old is on the cusp of a shot at a fourth Celtic Cross as Cork face Donegal in today’s semi-final. NOT MANY 21-YEAR-OLDS are on the cusp of a shot at a fourth TG4 senior All-Ireland title but Cork’s Eimear Scally is intent on helping her side to a 12th crown. Part of the Cork senior panel since 2014, Scally is a key cog in a fluid Cork forward line and her 2-3 tally from their convincing quarter-final win against Westmeath only continued her impressive scoring rate in 2018. The Éire Óg player had to be content with a place on the bench for Cork’s opening three games of the summer against Tipperary, Kerry and Monaghan, but a total of 3-9 from just two starts shows she’s on form. 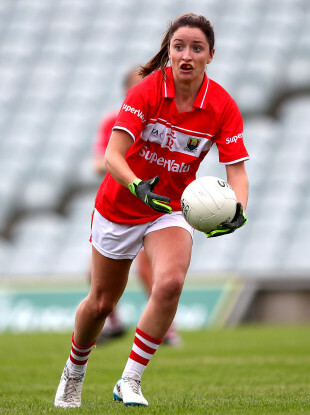 But Cork will be tested this afternoon when they face Donegal at Dr Hyde Park (2.45pm) in the last four, and with a huge prize up for grabs for the victors, Scally is keen to play her part and add to her 2014, ’15 and ’16 titles. “You never really look to the final,” said Scally. “Obviously, it’s always in the back of your head and you think ‘Jeez would be great to get to an All-Ireland again’, but you have to look at the next game. “I suppose people were talking to us, supporters and that, saying that it was expected for us to win against Westmeath, but we never, ever think like that. We only take each game as it comes. “We haven’t really played Donegal in championship football. The last big game we played against them was in the league final last year. This year they beat us too obviously in the league. It isn’t just Scally that has shown form in front of goal this summer for Cork, with her side accumulating a stunning 23 goals and 69 points in their five championship games to date. While Scally admits that last summer’s heart breaking two-point defeat to Mayo in the semi-final was a packed with regrets and what-ifs, she says there has been no concerted effort to try and amass goals in 2018. “I didn’t even know that we had scored that many this year. I suppose we have been lucky that way, we’re making the chances. In fairness we’re sticking them away well enough this year,” she said. “Going on last year we were left looking at goal chances – myself included – that we should have taken and that cost us in the end. We’re trying to be more clinical this time. “We are not too hell-bent on going for goals but if the chance is there you have to go for it. The bigger and better the teams you play, you will have to work harder for those chances, so when the chances comes for you, you have to take them. Email “'We are much better, way more focused and much more clinical' - Cork star Scally”. Feedback on “'We are much better, way more focused and much more clinical' - Cork star Scally”.